^ Ehrman، Bart D. (2005). Lost Christianities: The Battles for Scripture and the Faiths We Never Knew. Oxford University Press. صفحة 235. ISBN 978-0-19-518249-1. The four Gospels that eventually made it into the New Testament, for example, are all anonymous, written in the third person about Jesus and his companions. None of them contains a first-person narrative ('One day, when Jesus and I went into Capernaum...'), or claims to be written by an eyewitness or companion of an eyewitness. ... Most scholars today have abandoned these identifications, and recognize that the books were written by otherwise unknown but relatively well-educated Greek-speaking (and writing) Christians during the second half of the first century. ^ Ehrman، Bart D. (1 November 2004). Truth and Fiction in The Da Vinci Code: A Historian Reveals What We Really Know about Jesus, Mary Magdalene, and Constantine. Oxford University Press, USA. صفحة 110. ISBN 978-0-19-534616-9. In fact, contrary to what you might think, these Gospels don't even claim to be written by eyewitnesses. ^ Ehrman، Bart D. (1 September 2006). The Lost Gospel of Judas Iscariot: A New Look at Betrayer and Betrayed. Oxford University Press, USA. صفحة 143. ISBN 978-0-19-971104-8. 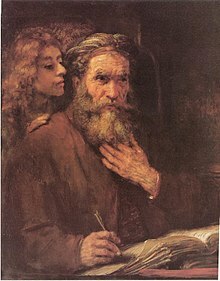 The Gospels of the New Testament are therefore our earliest accounts. These do not claim to be written by eyewitnesses to the life of Jesus, and historians have long recognized that they were produced by second- or third-generation Christians living in different countries than Jesus (and Judas) did, speaking a different language (Greek instead of Aramaic), experiencing different situations, and addressing different audiences. ^ Nickle, Keith Fullerton (1 January 2001). The Synoptic Gospels: An Introduction. Westminster John Knox Press. صفحة 43. ISBN 978-0-664-22349-6 – عبر Google Books. ^ Witherington، Ben (2 June 2004). The Gospel Code: Novel Claims About Jesus, Mary Magdalene and Da Vinci. InterVarsity Press. صفحة 44. ISBN 978-0-8308-3267-5. ^ Barnes، Albert (1962) . Barnes' Notes on the New Testament. Kregel Publications. صفحة 360. ^ Henry، Matthew. Matthew Henry Complete Commentary on the Whole Bible. StudyLight.org. ^ Lindars، Barnabas؛ Edwards، Ruth B.؛ Court، John M. (2000). The Johannine Literature. Sheffield Academic Press. صفحات 41–43. ^ Hahn؛ Scott, المحررون (1 September 2007). Letter & Spirit, Volume 3: The Hermeneutic of Continuity: Christ, Kingdom, and Creation. Emmaus Road Publishing. صفحة 225. ISBN 978-1-931018-46-3. ^ Kirby، Peter. "Gospel of Mark". Early Christian Writings. اطلع عليه بتاريخ 15 يناير 2008. ^ Meier، John P. (1991). A Marginal Jew. 2. New York: Doubleday. صفحات 955–6. ISBN 0-385-46993-4. ^ Helms، Randel (1997). 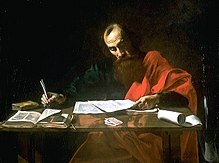 Who Wrote the Gospels?. Altadena, California: Millennium Press. صفحة 8. ISBN 0-9655047-2-7. ^ Guthrie، Donald (1990). New Testament Introduction. Leicester, UK: Apollos. صفحة 114. ^ Fonck، Leopold (1910). "Gospel of St. John". The Catholic Encyclopedia. Robert Appleton Company. ^ "Gospel According to John". Encyclopædia Britannica. اطلع عليه بتاريخ 19 نوفمبر 2010. ^ Brown، Raymond E. (1997). Introduction to the New Testament. New York: Anchor Bible. صفحة 164. ISBN 0-385-24767-2. ^ "Gospel of Mark". Early Christian Writings. اطلع عليه بتاريخ 17 فبراير 2016. ^ Wallace، Daniel B. (28 June 2004). "Hebrews: Introduction, Argument, and Outline". Bible.org.